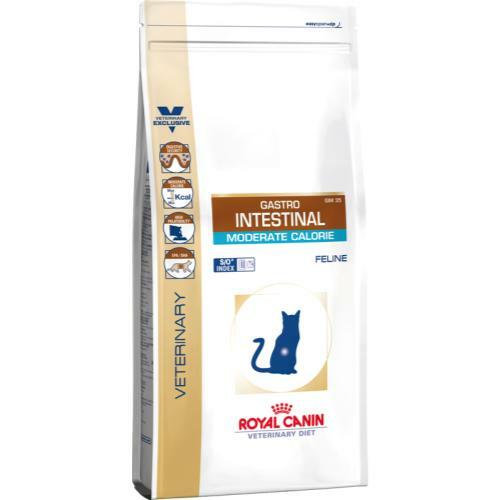 Royal Canin Veterinary Gastro Intestinal Moderate Calorie GIM 35 Cat food is a complete veterinary diet for the nutritional management of acute intestinal absorption disorders in cats, and as compensation for maldigestion. Made with highly digestible ingredients, increased levels of electrolytes and low in fat, its moderate calorie content makes it particularly suitable for cats in which ideal weight is hard to maintain, such as neutered or older felines. Moderate Calorie - to help maintain ideal weight. High palatability - to satisfy decreased or fussy appetites. EPA/DHA - to help maintain a healthy digestive system. rice, dehydrated poultry meat, wheat gluten*, maize gluten, vegetable fibres, hydrolysed animal proteins, animal fats, minerals, soya oil, beet pulp, egg powder, fish oil, yeasts, fructo-oligo-saccharides, psyllium husks and seeds, hydrolysed yeast (source of manno-oligo-saccharides), marigold extract (source of lutein).